Small Mammals: Little is known about the status small mammals in the project area. Large Mammals: Although exact estimates of large mammals in the project area are not available, population trends at a statewide level may offer some clues. Roosevelt elk, black bear, and cougar populations are likely stable and even increasing in the project area. There is reason to believe that black-tailed deer may be declining due to the loss of habitat and disease. This section includes two data summaries: Small Mammals, and Large Mammals— which describe the status and trends of important mammalian species the lower Coos watershed. This chapter focuses on population trends for key mammals within the project area and mammal habitat less than 20 miles outside the project area boundary (see Figure 1). The key mammals discussed include the North American beaver (Castor canadensis) and raccoon (Procyon lotor) in the Small Mammals data summary, and Roosevelt elk (Cervus canadensis roosevelti), black-tailed deer (Odocoileus hemionus columbianus), black bear (Ursus americanus), and cougar (Puma concolor) in the Large Mammals data summary. Although other deer and elk species such as the Rocky Mountain Elk (Cervus canadensis nelsoni) and mule deer (Odocoileus hemionus) occur elsewhere in Oregon (e.g., central and eastern Oregon), they are not discussed extensively in the large Mammals data summary. This chapter is not intended to be a review of hunting regulations. To ensure compliance with Oregon state laws, hunters are encouraged to contact the Oregon Department of Fish and Wildlife (ODFW). 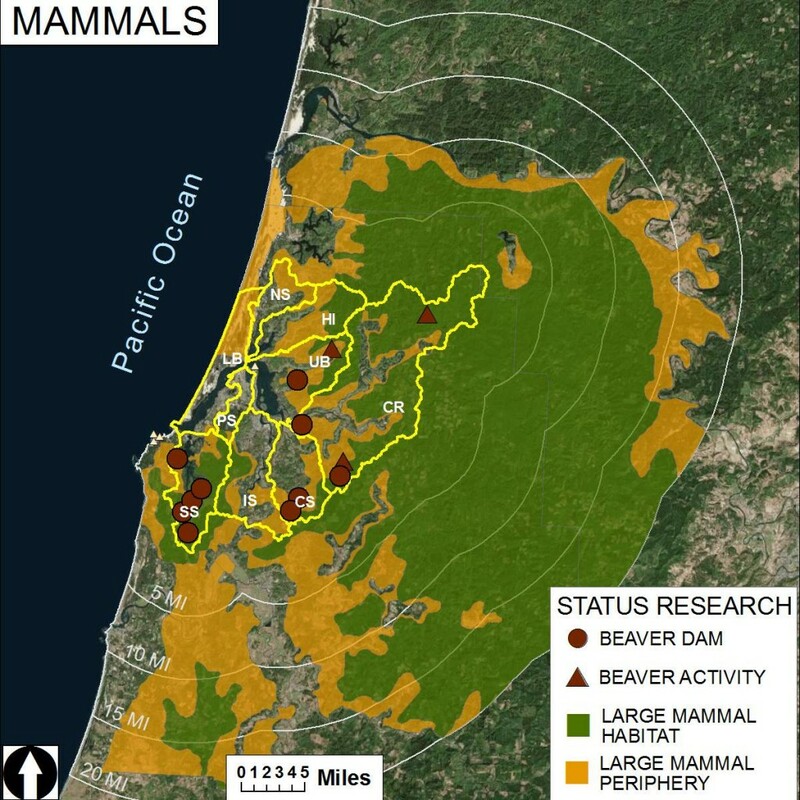 Small Mammals: Information about the abundance and distribution of beavers at a statewide level was provided by ODFW (2004, 2006a). Additional information was provided in peer-reviewed studies by Hiller (2011), ODFW (2013), and Nordholm and Miller (2008). Data detailing the presence of beavers in streams within the project area were provided by ODFW-sponsored research (Nordholm and Miller 2008), which was supplemented by work from the University of Oregon (Cramer 2010). Very little is known about the abundance and distribution of raccoons within the project area and state-wide. However, some information about the behavior of raccoons as intertidal predators is available from Davidson (1990). Basic ecological information about small mammals (including beaver-salmonid interactions) and assessments of public opinion are available through ODFW (n.d.a), Oregon State University (Csuti et al. 1997), the Audubon Society (n.d.), and other researchers (Cramer 2010, Collen and Gibson 2001, Davidson 1990, Duke 1982, Fouty 2003, Jones et al. 1996, Kemp et al. 2012, Lawton and Jones 1995, Leidhold-Bruner et al. 1992, Needham and Morzillo 2011, Petro et al. 2015, Rodgers et al. 1987, Snodgrass and Meffe 1998, Wright et al. 2002). Small Mammals: Information about historic and current beaver abundance is available at a statewide level, but this information likely underestimates true beaver abundance because data collection is often restricted to salmon-bearing streams. Beaver data from the project area are limited, and focus entirely on the South Slough Subsystem. It should be noted that the reliability of beaver abundance data is limited by methodological shortcomings. For example, in surveying beaver populations, the presence of beaver activity (e.g., ponds, dams, trails, chews, etc.) is commonly used as a proxy for beaver abundance. However, research shows that these indicators may be poor substitutes for population information because the number of beavers present may not be correlated with the number of lodges, bank dens, or beaver dams in any one area (Swafford et al. 2003). Camera trapping as a beaver surveying method may hold promise, but for Cramer (2010) the camera’s motion sensor was triggered by wind-blown vegetation and not by the presence of beavers. Large Mammals: Estimating the population of deer, elk, bears, and cougars is difficult due to these animals’ secretive life histories and their densely vegetated habitats (ODFW 2006b, 2008). Love (pers. comm., April 29, 2015) explains that aerial survey methods rely on the visual detection of animals to produce an estimate of herd composition, a method with limitations (e.g., weather and dense cover) that can reduce the effectiveness of the survey effort. He adds that alternative survey methods (e.g., true population counts using ground survey techniques) generally produce less reliable results because the presence of surveyors in the field can influence the behavior of the animals being surveyed. Bear survey methods involve deploying bacon baits containing a tetracycline biomarker used to generate mark-recapture data (see Background section in the Large Mammals data summary). Since this survey takes place during spring when bears are very active, the baits must be placed at least 5 linear miles apart to ensure that a single bear does not consume multiple baits in any one year. As a result, the geographic extent of a bear survey area must be expansive to ensure enough bears are marked to produce reliable population estimates with sufficiently small confidence intervals (S. Love, pers. comm., April 29, 2015). For this reason, bear population data are not available for relatively small areas (e.g., the lower Coos watershed). Large Mammals: The most recent data for deer and elk herd composition, elk population trends, and Deer Hair Loss Syndrome prevalence within ODFW’s Tioga and Sixes Game Management Units (GMUs or Units) were provided by ODFW’s Charleston Field Office (ODFW 2015). Data describing recent trends in cougar populations were provided by the same source but are only available at a statewide level. Interpretation of recent deer and elk population trends within ODFW’s Tioga and Sixes GMUs was facilitated by personal communication with a local expert (S. Love, pers. comm., April 29, 2015). A series of ODFW management plans and hunting forecasts (ODFW 2003, 2006b, 2008, 2012, 2014) provided information regarding many of the topics discussed in the large mammals data summary, including population estimates at a statewide level, historical context for interpreting long-term trends, and a description of the contributing factors explaining historic trends. In many cases, interpretations of historic large mammal population status and trends offered by ODFW (2003, 2006b, 2008, 2012, 2014) are supported by information from peer-reviewed journal articles, books, technical reports, and other resources as follows: Deer and elk- Ackerman et al. 1984, Anderson 1983, Beier and Barrett 1993, Cashman et al. 1992, Logan et al. 1996, Neal et al. 1987, Oregon Forest Resources Institute 2013, Pamplin 2003, Robinette et al. 1959, USDA n.d., White et al. 2010, Yarkovich et al. 2011; Bears- Bailey 1936, Foreyt 2001, Herrero et al. 2011, Pamplin 2003, Pelton 2000, Rogers and Rogers 1976, Samuel et al. 2001, White et al. 2010, Yarkovich et al. 2011; Cougars: Ackerman et al. 1984, Anderson 1983, Anderson and Lindzey 2005, Beier and Barrett 1993, Cashman et al. 1992, Chinitz 2002, Cougar Management Guidelines Working Group 2005, Iriarte et al. 1990, Keister and Van Dyke 2002, Logan et al. 1996, Neal et al. 1987, Nowak 1999, Robinette et al. 1959, White et al. 2010, Yarkovich et al. 2011. Information about basic large mammal ecology and range maps are provided by both ODFW (2006b, 2008, 2012, n.d.b) and peer-reviewed sources (Graber 1990, Hellgren et al. 1997, Hellgren and Vaughan 1989, Link 2004, Vander Heyden and Meslow 1999). In addition to spatial limitations, it should be noted that bear survey data rely on the successful harvest of a bear and the removal and processing of one of its pre-molar teeth in a laboratory. Since these processes can take a considerable amount of time, bear population estimates are considered to be a “lagging indicator,” meaning that the current population estimate is designed to indicate trends occurring two years prior (S. Love, pers. comm., April 29, 2015). Bear surveys also rely on the telltale marks which bears leave on trees to verify that a bear (rather than some other animal) has consumed the tetracycline bait. Although this method is fairly accurate, it’s not 100% reliable since gray foxes (Urocyon cinereoargenteus), which leave similar scratch marks on trees, have been documented eating tetracycline baits intended for bears. According to ODFW (2006b), generating an estimate of cougar abundance is “not an exact science.” These estimates often rely on computer-generated models whose accuracy relies on reviews of existing literature. Model-generated estimates are typically presented as ranges between two numbers determined by the data’s confidence intervals. For more information about the confidence intervals of statewide cougar estimates, see the Oregon Cougar Management Plan (ODFW 2006b). Finally, it should be noted that use of alternative metrics (e.g., annual patterns in harvest data, damage reports, etc.) as a proxy for total large mammal populations is subject to a variety of limitations, due to several extraneous variables. For example, variation in harvest rates may be related to food availability rather than true abundance trends (Fieberg et al. 2010, Howe et al. 2010). Similarly, data related to non-hunting conflicts may reflect changes in landscape characteristics, land use, or regulations rather than actual population trends (Merkle et al. 2011, Howe et al. 2010). Harvest data alone are subject to substantial variation related to hunter effort and hunter success, two variables that are at least partially independent of game abundance (e.g., precipitous reductions in the success rate of Oregon bear and cougar hunters in 1994 following the prohibition of dogs and bait as hunting aids). Collen, P., and R. J. Gibson. 2001. The general ecology of beavers (Castor spp. ), as related to their influence on stream ecosystems and riparian habitats, and the subsequent effects on fish: a review. Reviews in Fish Biology and Fisheries. 10: 439–461. Cramer, Alison. 2010. The Role of beavers in Salmon Management: A Literature Review and Test of Method. [Undergraduate Honors Thesis, Department of Biology, University of Oregon]. Csuti, B., T. A. O’Neil, M. M. Shaughnessy, E. P. Gaines, J. C. Hak. 1997. Atlas of Oregon Wildlife, first edition. Oregon State University Press. Corvallis. Davidson, Seana K. 1990. Raccoon Foraging in the Tidal Flats of the Coos Estuary. [Undergraduate Thesis, Department of Biology, University of Oregon]. Duke, Stephen D’wayne. 1982. Distribution of Fishes and Their Relationships to Environments in Selected Coastal Streams, Douglas and Coos Counties, Oregon. Masters Thesis. Department of Fisheries, University of Oregon. Fouty, Suzanne C. 2003. Current and Historic Stream Channel Response to Changes in Cattle and Elk Grazing Pressure and Beaver Activity. Doctoral Thesis. Deptarment of Geography, University of Oregon. Hiller, T. L. 2011. Oregon furbearer program report, 2010-2011. Oregon Department of Fish and Wildlife, Salem, Oregon, USA. Howe, E. J., M. E. Obbard, R. Black, and L. L. Wall. 2010. Do public complaints reflect trends in human-bear conflict? Ursus 21:131–142. Jones, C. G., J. H. Lawton, and M. Shachak. 1996. Organisms as ecosystem engineers. In Ecosystem Management (pp. 130-147). Springer New York. Kemp, P. S., T. A. Worthington, T. E. Langford, A. R. Tree, and M. J. Gaywood. 2012. Qualitative and quantitative effects of reintroduced beavers on stream fish. Fish and Fisheries. 13(2): 158-181. Lawton, J. H. and C. G. Jones. 1995. Linking species and ecosystems: organisms as ecosystem engineers. In Linking species & ecosystems (pp. 141-150). Springer US. Leidholt-Bruner, K., D. E. Hibbs, and W. C. McComb. 1992. Beaver dam locations and their effects on distribution and abundance of coho fry in two coastal Oregon streams. Northwest Science. 66: 218–223. Needham, M. D. and A. T. Morzillo. 2011. Landowner incentives and tolerances for managing beaver impacts in Oregon. Final project report for Oregon Department of Fish and Wildlife (ODFW) and Oregon Watershed Enhancement Board (OWEB). Corvallis, OR: Oregon State University, Department of Forest Ecosystems and Society. Nordholm, Katherine E. and Bruce A. Miller. 2008. Beaver Activity in Winchester Creek, Coos River: an Inventory of Dams, Pools, and Potential Barriers to Fish Passage. [a report for the Salmonid Life-Cycle Monitoring Project of Oregon Department of Fish and Wildlife]. Oregon Department of Fish and Wildlife (ODFW). 2006a. Oregon Conservation Strategy. Oregon Department of Fish and Wildlife, Salem, Oregon. Oregon Department of Fish and Wildlife (ODFW). 2015. Herd Composition, Trend Estimates, and Dear Hair Loss Syndrome. [Unpublished data from the ODFW Charleston Field Office]. Petro, V.M., J.D. Taylor, and D.M Sanchez. 2015. Evaluating landowner-based beaver relocation as a tool to restore salmon habitat. Global Ecology and Conservation. 3: 447-486. Rodgers, J. D., R. D. Ewing, and J. D. Hall. 1987. Physiological changes during seaward migration of wild juvenile coho salmon (Oncorhynchus kisutch). Canadian Journal of Fisheries and Aquatic Sciences.44:452–457. Snodgrass, J. W. and G. K. Meffe. 1998. Influence of beavers on stream fish assemblages: effects of pond age and watershed position. Ecology. 79: 928–942. Swafford, Seth R., Dale L. Nolte, Kris Godwin, Charles A. Sloan, and Jeanne Jones. 2003. Beaver Population Size Estimation in Mississippi. USDA National Wildlife Research Center – Staff Publications. Paper 277. Wright, J. P., C. G. Jones, and A. S. Flecker. 2002. An ecosystem engineer, the beaver, increases species richness at the landscape scale. Oecologia,132(1), 96-101.